It’s that time of year again for the Manitou Springs Great Fruitcake Toss! This even is a popular local even that draws travelers from all over the country. Not sure what to do with those leftover fruitcakes from Christmas? Come toss them, throw them, hurl them, catapult them, or whatever manner you want to get them from here to there! 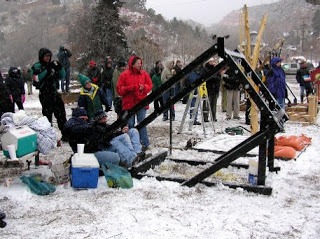 And while you’re here enjoying the fruitcake toss, stay with us here at Rocky Mountain Lodge & Cabins in our Manitou Springs Bed and Breakfast Lodge and enjoy our signature 3-course breakfast in the morning before heading out… it’ll keep you full till nearly dinner time (we won’t be serving fruitcake).